Even as smoke drifted over thousands of charred homes and buildings after days of deadly insurrection and looting in Detroit, President Lyndon B. Johnson called upon experts to determine the root cause of racial disorders that swept scores of U.S. cities in the summer of 1967. A police raid at 12th Street and Clairmount on Detroit's west side had ignited a firestorm of long-suppressed rage. Rage at a nearly all-white police force notorious for brutalizing and humiliating people of color; at a political structure that marginalized the voices of African-American residents; at schools and neighborhoods that kept integration at bay, and at a future with little prospect for black advancement. So it was that a confrontation at one Detroit intersection led the city to another: decades of economic policies, political campaigns, crime initiatives and social movements, mixed with no shortage of heartache, all meant to reverse the tide of history. Today, and throughout this year, the Detroit Journalism Cooperative (DJC) will explore whether the social and economic conditions that sparked the tragic events of 1967 have improved in Detroit. In the wake of recent unrest in Ferguson, Baltimore and other American cities, such questions are hardly academic. We begin today with an exploration of power and whether, nearly a half-century since the uprising, ordinary residents have more of a voice in the city's destiny as Detroit attempts to rebuild after a shattering municipal bankruptcy. 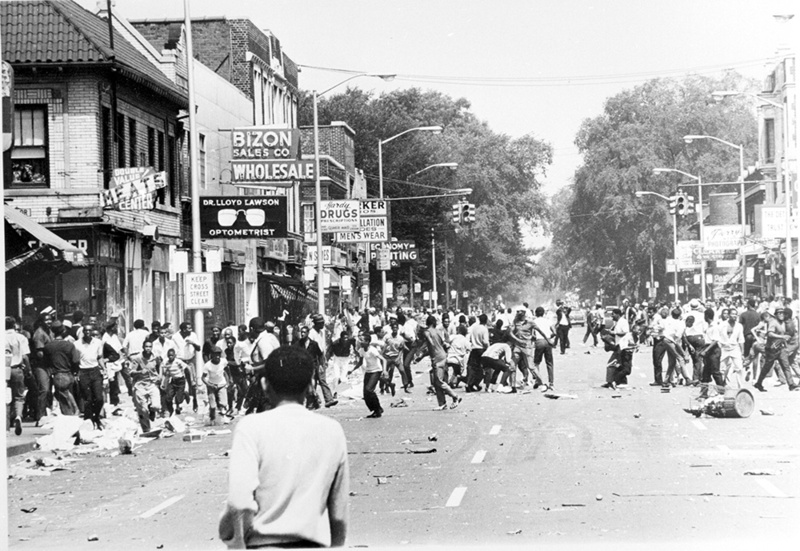 In future installments, we will tackle other conditions that helped to ignite the violence of 1967 – racial attitudes, police-community relations, poverty, housing, etc. – and track what progress Detroit has made, or not made, since 1967. DETROIT – Stately, stout Charles Williams II takes the microphone in an old church auditorium on Detroit’s west side and convenes the Saturday rally with a familiar war cry. “NO JUSTICE!” Rev. Williams shouts, stopping conversations and focusing attention on the front of a smallish room. “NO PEACE!” yell back some 65 people. The rally is a weekly meeting of the Detroit chapter of the National Action Network, the nationwide civil rights organization founded by the Rev. Al Sharpton in 1991. Williams heads the local chapter, in addition to serving as pastor of Historic King Solomon Missionary Baptist Church, a renowned house of worship that now needs repairs, located a few blocks from the Motown Museum on the city’s west side. There are several items on the agenda, and Williams touches on issues that have driven the group into Detroit’s streets in the recent past: home foreclosures; water shutoffs; Michigan’s emergency manager law; the city’s bankruptcy and cutbacks to pensioners; violence; Flint’s water crisis; and Mayor Mike Duggan. While Duggan has a positive image among many Detroiters, suburbanites and the local media as a commanding Mr. Fixit who is shoring up the city as it recovers from bankruptcy, the view at King Solomon on this Saturday morning is considerably more skeptical. Williams, 35, who sometimes calls Duggan “Livonia Mike” – a sarcastic reference to the white mayor’s longtime suburban home before he moved into Detroit to run for mayor – tells the crowd Duggan has invited him to his office for a meeting, but he’s having second thoughts about attending. Switching into preaching cadence, Williams says, “We have to make sure we hold them folks accountable,” as the audience cheers. “So I may not do no backroom meeting. I may have to tell him to come here, in the front row. That might be the better way to deal with him, and to make sure he has an opportunity to hear what people are saying. This is indeed a fraught moment for Detroit. The city’s short-term financial recovery, newly lit streetlights and restaurants that serve celery root Agnolotti in a short rib ragu have attracted a burst of positive international attention. Locally, Detroit has become so cool in some quarters that suburbanites who repeat the once-familiar boast that they haven’t ventured downtown in years come across as tone-deaf dinosaurs. But to many black residents, the resurgence around downtown, while welcome, has done little to lift the despair that permeates desolate corners of their sprawling city. In their view, the rehabbed condos, rising hockey arena and farm-to-table dining establishments in the Woodward Avenue corridor cater to the pleasure of the young, mostly white professionals who have returned to live, work or party downtown. African Americans may now control who’s elected mayor or to city council in this predominantly black city. But nearly 50 years after racial despair led to deadly insurrection and rioting, a view persists that white political and business interests (in Lansing, and in more affluent surrounding counties) continue to steer the city’s course. It is against this backdrop ‒ and the national "Black Lives Matter" protests ‒ that Williams’s group and other activist organizations, most of which have formed in the past few years, have stormed onto city streets with a militancy and drama that recall the days immediately following the events of 1967, even if their gains are harder to gauge. Back then, the city brimmed with aggressively radical organizations of blacks and whites such as the West Central Organization (focusing on urban renewal and school desegregation): State of Emergency Committee and Ad Hoc Committee (police); League of Black Revolutionary Workers and Dodge Revolutionary Union Movement (labor); Shrine of the Black Madonna (black nationalism); Parents and Students for Community Control (schools) and Marxist, Trotskyist and Maoist groups. As one economist later told the Kerner Commission, convened by President Lyndon B. Johnson to examine the cause of racial uprisings in Detroit and elsewhere in 1967, “black power” groups had come to conclude that despite the gains of the civil rights movement, blacks had “not experienced tangible benefits in a significant way.” Real change could only come about when blacks united as a political force. Heather Ann Thompson, a history professor at the University of Michigan who grew up in Detroit, wrote in her 2001 book, “Whose Detroit?” that radicals, conservatives and liberals slugged it out for their vision of the city, and “Detroit became a war zone” following 1967. Detroit police were a particular target for ‘60s-era radicals. Black Detroiters had long viewed the overwhelmingly white DPD as an army of occupation, and, under Mayor Roman Gribbs in the early 1970s, the department unleashed an undercover decoy squad called STRESS – Stop the Robberies, Enjoy Safe Streets – that in its first nine months of operation killed 10 suspects, nine of them black. Led by Marxist attorney Kenneth Cockrel Sr., Detroiters organized marches, rallies and media campaigns to get rid of the unit. One of the results of those marches and proselytizing was the transformative election of Coleman Young as Detroit’s first black mayor in 1974. Detroit Mayor Roman Gribbs, who served from 1970-74, oversaw the police department when it created an undercover unit known as STRESS, which was widely despised by the black community. Today’s activists are attempting to address some of the same issues – neighborhood revitalization, education, poverty, racism and jobs. They are demanding social and economic justice for neighborhoods eviscerated by 60 years of white flight, business disinvestment, crime, drugs and government indifference. Yet while many concerns, hauntingly, remain the same, the context has changed: Black Detroiters made up more than 40 percent of the city’s population after the events of 1967, but had little presence or say in city government. A large part of the dissension then revolved around getting a seat at the table. Today, blacks are routinely elected to leadership positions, while filling nearly every level of city government. The irony is that, through a variety of factors from Detroit’s shrinking population to what residents perceive as the state legislature’s barely disguised antipathy toward the city, Detroit’s political leaders don’t carry nearly the clout they wielded in 1967. The new generation of community activists is trying to fill that void. One group, New Era Detroit, a highly disciplined, black-nationalist organization, in November blockaded a Detroit gas station whose employee, the group said, harassed a young African-American boy. It is, in many ways, the same potent demand for black power that activists painted on buildings and streets during and after 1967. Black power became a reality in Detroit in many ways in the years that followed, as a cadre of young, idealistic African Americans – and a number of white lawyers and activists – changed the jury-selection process in Detroit’s criminal court to include more black jurors; confronted the brutality of the Detroit police, and, most importantly, elected Young. Young’s election demonstrated – for the first time – what black Detroiters were capable of achieving once they were given the reins of government At a time of extreme racial polarization, Young recognized his election was made possible by the white evacuation that eventually gave Detroit the most unusual demographics of any large American city – by 2000, more than 8-in-10 residents were African American. Young’s assessment was fueled by the often caustic rhetoric and Detroit bashing from suburban residents and leaders over the years, personified in the obstructionism and criticism of L. Brooks Patterson, the longtime Oakland County Executive. “I don’t give a damn about Detroit,” he was once famously quoted as saying. Today, the long-hardened boundaries between city and suburbs – long symbolized by 8 Mile Road – are slowly blurring. In some ways the city is becoming suburbanized, and the suburbs are becoming urbanized. That can be seen as a mostly positive development but one that’s also had the effect of diluting the influence of city leaders in some ways. In one remarkable reversal, white people are beginning to move into the city, even as African Americans who can afford to continue to move out, according to U.S. Census data, though Detroit remains overwhelmingly black. The Cooperative includes The Center for Michigan’s Bridge Magazine, Detroit Public Television (DPTV), Michigan Radio, WDET and New Michigan Media, a partnership of ethnic and minority newspapers. Funded by the John S. and James L. Knight Foundation, The Ford Foundation, and the Corporation for Public Broadcasting, the DJC partners are reporting about and creating community engagement opportunities relevant to the city’s bankruptcy, recovery and restructuring. Detroit’s suburbs, even such one-time bastions of segregation as Dearborn to the west and the Grosse Pointes to the east, are increasingly diverse, which contributes to a lowering of the temperature of anti-Detroit rhetoric. Even so, some observers note a scarcity of African Americans in Detroit’s burgeoning shopping and entertainment spots, which in turn has ignited a sometimes contentious debate over why that is so, or even if it is true. No one in Young’s day would have predicted how, in the early 21st Century, suburbia would produce Detroit’s last two mayors: Duggan, who is white, and Dave Bing, who is black. Both moved into Detroit after decades in the suburbs for the sole purpose of running for office. At the same time, many of Duggan’s top appointees live outside the city, which would have been unheard of – and against a now-defunct residency ordinance – 25 years ago. More recently, regionalization initiatives have diminished the mayor’s power, driven largely by the city’s financial crisis. After decades of bickering, a drive to regionalize services and institutions once controlled by Detroit has become a fait accompli in some important ways: The operations of the Cobo convention center, the zoo, museums, city water department and Eastern Market are now run by authorities and nonprofits with boards made up of Detroiters and suburbanites. The state has run the island park of Belle Isle for more than a year. And millages passed by suburban residents in Wayne, Oakland and Macomb counties in the past decade help support the Detroit Institute of Arts and Detroit Zoo. Mayor Young often referred to many of these landmarks as Detroit’s “jewels,” which he vowed never to relinquish, though the city still owns them all. Despite the gradual improvement of Detroit’s image and city-suburban relationship, one fact hasn’t changed since 1967: Too many black Detroiters remain impoverished, unskilled, badly educated and alienated from the improvements in the city’s core. By several statistical measurements, conditions for black Detroiters have not improved in the nearly 50 years since the riot. Two crises, the Flint water emergency and the financial and physical deterioration of Detroit and its schools, have trained a national spotlight on state government’s indifference toward poor, black city residents, according to activists like Rev. Williams. Williams said corporate interests downtown, led by Quicken Loans founder Dan Gilbert and Little Caesars Pizza owner Mike Ilitch, who also owns the Detroit Tigers, Red Wings and the Fox Theatre, appear to be thriving, with companies controlled by both men gobbling buildings and real estate in downtown and Midtown. In some ways, criticism of Duggan – who has served just over two years as mayor – reflects the decades-old imbalance between downtown and neighborhoods and the even older inequity between white and black wealth in the United States. Duggan has made neighborhood improvement the main focus from the first day of his campaign, and his administration has shown results in turning on street lights, demolishing abandoned structures, cleaning up city parks and making it easier to purchase and pay taxes on houses. Duggan declined to comment for this story. Darden, the MSU professor, acknowledged the mayor's accomplishments, but noted there has been far less business investment in neighborhoods outside downtown and, despite the presence of many African-American business people and professionals, almost no black Detroiter with vast wealth who is making a major mark on the city. That imbalance is on vivid display as suburban billionaires Gilbert and Ilitch, who are white, remake downtown with investments and projects that are widely praised, and in the case of Ilitch’s new hockey arena, partially supported by the public. In February, Bing, the former mayor, entered the fray, saying there was a growing frustration in the African-American community with a lack of black involvement in Detroit's comeback. "As much as we say or think we are being inclusive, the reality is we are not," Bing told a policy conference of the Detroit Regional Chamber. "Detroit's not far from Ferguson, Baltimore or Chicago. Maybe just an incident away." Still, many black Detroiters appear more confident in the future, a contrast from their feelings before the city entered bankruptcy in 2013, with roughly 7-in-10 recently polled by the Detroit Free Press saying they are optimistic about the city’s future. Even on combustible issues like whether the state should continue to have oversight of the city’s fiscal affairs, there is no consensus among residents. The Rev. David Alexander Bullock, who leads the three-year-old social justice organization Change Agent Consortium, said he sees a large divide between African Americans who are economically comfortable and those who are poor. In his view, more comfortable black Detroiters and suburbanites are generally unmotivated to go to bat for struggling African-American residents, who in turn are too busy fighting for survival to mobilize politically. “There are really three groups of blacks,” said Bullock, pastor of Greater St. Matthew Baptist Church in Highland Park, and a star of the Oxygen network’s “Preachers of Detroit” reality show last year. “There are elite blacks; the formerly middle class blacks who are barely middle class, and their children and grandchildren; and the blacks that nobody wants ‒ the mentally ill, the people who are constantly going in and out of prison, the folks that can’t read. Many well-off blacks have adopted “a politics of accommodation,” Bullock said, because they feel they’ve made it. Regionalizing Detroit’s cultural institutions and services may not be in the interest of Detroit residents, he said, but not enough people who had the power to complain did so. “If you had a stronger protest movement in Detroit many of those things would not have happened,” Bullock said. Of course, not all residents that activists are attempting to mobilize necessarily object to the changes reshaping their city. Indeed, many Detroiters share the view that Belle Isle, Eastern Market, the museums and Cobo are better financed and in better shape today than when they were controlled exclusively by the cash-strapped city. In the Free Press poll, published in December, a year after city bankruptcy ended, more than half of city residents said conditions had improved. They gave high marks to Duggan and Police Chief James Craig, a media-genic executive under whom some crime has dropped and police emergency response times appear to have improved (though 43 percent said they would leave Detroit if they could afford to). Sheila Cockrel, a business consultant and Wayne State University instructor who is a former member of the Detroit City Council, said it’s important to note that Detroit continues to own the “jewels” that are now under a more regionalized control. She argues the arrangements make sense for the city – still struggling financially despite emerging from bankruptcy – and its residents. If Coleman Young’s election marked the apex of black political power, the years following his death have corresponded with a decline in the authority and power granted to Detroit mayors. Young entered office vowing to reform police and give black Detroiters a voice in city government that they never had before. And he delivered. Young dismantled the despised police STRESS unit and established affirmative action programs in the DPD and other city departments. To establish community-based policing, Young opened mini-stations in dozens of neighborhoods, and saw that city contracts were spread out to black businesspeople, who largely had been shut out before a black man became the boss at city hall. While Young could be abrasive and profane, and he alienated whites by bringing up the problem of racism in metro Detroit, he was an integrationist who had a diverse team of appointees and generally preached the necessity of racial unity. Even as he called for harmony, Young also communicated the idea of black pride to Detroiters. During election campaigns, he sometimes spoke in a coded racial language about how “we” have fought to maintain the city in the face of outside oppression and how “they” (that is, suburban whites) want to control the city and steal the “jewels.” He defended even legitimate criticism of the police department as attacks on affirmative action. He cracked down on city workers, especially white cops and firefighters, who violated the city’s residency requirement. Young decided not to run for a sixth term in 1993 after 20 years in office. He died in 1997, and some argue that an era of strong black political power died with him. That same year, the state legislature abolished Recorder’s Court, Detroit’s criminal court since 1824, and ordered its judges and staff merged with the court system of surrounding Wayne County, which was mostly white. In 1998, management of the Detroit Institute of Arts was spun off to the Founders Society, the longtime nonprofit associated with the museum. In 1999, acting on pleas of mainly white cops and firefighters, the state legislature ended Detroit’s decades-long rule that required city workers to live in the city, a move that accelerated flight to the suburbs and, with it, the loss of desperately needed tax revenue. Detroit’s other institutions were reorganized in the ensuing years. Other decisions coming from Lansing also rankled, from steep cuts in state aid to, most notably, the state’s decision to appoint an emergency manager for Detroit before the city sought federal bankruptcy protection. Times have changed since the civil rights battles of the 1960s and 70s, and so have the activists seeking to change Detroit today. With thick-rimmed glasses, a studious appearance and well-tailored suits, Rev. Williams blends in with the crowd at the Detroit Athletic Club, where he is a member. Once a fussy citadel of WASP-ish privilege, the DAC, like virtually all institutions in Detroit, was whites-only until the 1970s. The DAC admitted its first black member in 1979 ‒ Robert P. Young Jr., now chief justice of the Michigan Supreme Court. Rev. Williams was born the next year in Henry Ford Hospital in Detroit, but his family moved four years later to Birmingham, Alabama, where his father, a postal worker, had been transferred. Williams said the seeds of his activism were sown as he grew up reading about the civil rights movement, and a personal experience when he was 12 while shopping with his mother in an Alabama fabric store. Williams returned to Michigan for college at Eastern Michigan University, where he started working with Sharpton’s National Action Network around the issue of affirmative action in education. He later worked in labor and community organizations before deciding to become a minister. His church, Historic King Solomon Baptist Church on 14th Street, was the site of speeches by both the Rev. Martin Luther King, Jr. and Malcolm X.
Williams contends that a lot of the issues in Detroit are explained as race issues, but they are actually more about class. But the racial angle prevents needy people of both races from working together. “My mission is not necessarily to be a race leader or a race baiter or a race this or a race that. The mission is to make sure everybody has a chance to be taken care of. And that everybody gets access and opportunity." It’s why Williams used Mayor Duggan as a foil during his Saturday rally, and attacked wealthy white business people who received tax breaks, public financing and breaks on their water bills, even as impoverished black residents have had their drinking water turned off. “I ain’t doing no play time,” the reverend said to the mayor who wasn’t there. A thriving city requires a low jobless rate which requires an educated workforce which requires a student who is ready to accept an education and an educational system which is able to deliver that education. It is not a one time thing where graduation is the end, but rather graduation is the beginning to lifelong learning. For Detroit to thrive, you need to decrease the illiteracy rate which some studies have pegged at over 40%. The students have to show up for school on time, not disrupt the class, do the assigned work, and keep at it until they fully understand what is being taught. It can be done. Dr. Ben Carson went through the Detroit system, and today is one of the brightest minds in the United States. It will not be done overnight, and no one is going to give people instant success without some effort on their part. In order to change the education issue, you would have to counter the lies about "Blacks who care about education are acting White." It would laughable if the stories (other cities, not Detroit) weren't true about young Black students attacked by other Black students who are trying to hold back the studious Black honor roll students. A major problem is the young people who seem to not know the thirst for knowledge/education IS ACTING BLACK AND NOT A WHITE THING. Don't their schools bring up how to hold black slaves back they would seriously get punished if they were trying to learn to read/education, but many were determined to learn anyways. It just makes the many accomplishments of African Americans during that era even more impressive. The studies were African Americans do great on tests presented as something other than a test/quiz are remarkable. Could some of Michigan's several colleges teaching future teachers get a grant to work on Public Service Announcements, social media tags, or other ways to promote that the thirst for knowledge and finding out how things work/improving them isn't owned by any group (i.e. not Asian, White, Native American Indian, African-American/Black, Muslim, Aztec, Hispanic, Religious, Athiest, ...). To support literacy many areas do the Dolly Parton Imagination Library, free books from birth to age 5 (Tennessee has/had there who state signed up and the results are impressive). Detroit could get boosters to provide books, but the area picked can't exclude anyone. Years ago I found out the Jewish community offer free materials (books/music) to promote their faith and although they charged some fees for the service they listed it for free to people in Detroit. Don't know how often one would have to take their child to a synagogue, but their website http://jewishdetroit.org/programs/jewish-education/family-programs/ seems like a nice resource for young families in Detroit and the books go for older kids. Maybe the kids learn to read Hebrew, in addition to English. If you live outside Detroit the older website is https://pjlibrary.org/Home and the about link says, "Families with kids ages 6 months through 8 years old with Judaism as part of their lives, are welcome to sign up, regardless of their Jewish background, knowledge, or observance." Not Jewish, but if you are promoting a multi-cultural, tolerant community, letting people know the help exists might be a good thing; especially if a family could use the hope that religion gives to many that things will or can get better. With Hope you can work toward meeting a dream and eventually get closer to that dream. Many in Detroit need Hope, Encouragement, a way to connect with others to help them work toward a better future, and a way to help others so they can encourage others also. Since this article claims to be about 'power' I am surprised it makes no effort to define 'power' in the article and am concerned about the impact/value of the article. I wonder if Mr. McGraw had establish a reference definition of 'power' for the article. There are a few reasons I have for wanting a reference definition of 'power' for this article; it would have established a common reference for all readers to use when analyzing article and when talking about it, a definition would have framed the article for the readers giving them a theme to link the different elements of the article together, and it would have help Mr. McGraw frame how he developed the article. How can we see the ebb and flow of 'power' in Detroit and its impact Detroit if we don't what it means? Is power about control of government money, about private money, about how money is spent and the impact it has, it is about employment [who gets hired and the knowledge and skills of those jobs], is it about, rules/laws that control how people act, is it about the quality of life people have, is it about conditions and how they are improved or deteriorate, etc.? How can we say who has 'power' and when and what they do with that 'power' if there is no definition we all can use when reading this article. How can we even tell if 'power' mattered in Detroit? Could it have been that the lack of knowledge and skills in understanding and the use of 'power' is what created the events that has brought Detroit to where it is today? Could it have been that the nature of Detroit prevented any level of 'power' no matter how well it was applied to change events? Without a well thought out definition of 'power' anything anyone claims to learn from this article, even the series will be suspect and easily challenge because whoever is speaking will be using their definition of 'power' and it will be different from everyone else's. If one doesn't understand what 'power is how can they realize that they have 'power' and without that realization that they have 'power' then how likely are they to use it effectively? I would encourage Mr. McGraw to add a note to the opening of the article that defines 'power' in his article. I would also encourage Bridge to do that for each of the articles in the series; 'police' [all law enforcement, City, county, prosecutors, etc. ], 'poverty' [financial, social, hunger, clothing, housing, medical care, etc. ], 'racial attitudes' [individual, generic, economic, educational, geographic, etc. ], 'schools' [learning, facilities, subjects, academics, structure, etc. ], 'justice' [problems similar to 'power'], segregation [social, economic, educational, geographic, self imposed, ethnic, historic, etc.]. To simply use a word that is defined by each reader to fit their perspective ensures that little will be learned and the articles will be more likely to reinforce established views of Detroit. This series could be very valuable it they can help people look and listen beyond how they have looked at events and conditions. "Power" is easily defined, Duane. It is the ability to get people to do that which they otherwise would not. It's clear who has that ability in Detroit economic matters. John, You make my point, I have a different definition of 'power'. I see 'power' as making things happen with or without the consent of others, constructive or destructive. Your definition seems to be more about influence. A dictator vs. a Mayor. With that simple difference in our personal definitions we read the article differently. Aside from some events or situations, I done see that anyone has had sustained 'power' in Detroit to make any substantial changes, rather it has simply been a random progression of events. Pick any type of change and I will say it existed 50 or 100 years ago. The players maybe different they still play out the same. There is no one person or small cadre of people that have the 'power' to change Detroit, it will take leadership, structured/disciplined approach, and community support for there even to be hope for change. I don't see what a person with 'power' could do to produce a lasting change, surely not someone in Detroit or Lansing or Washington. "Young’s election demonstrated – for the first time – what black Detroiters were capable of achieving once they were given the reins of government." The comment writes itself. Detroit seems to be a new playground for certain wealthy people who like to throw their money around (and flaunt their egos at the same time) building sports palaces etc. while life for the poor continues to grind on to an uncertain future. People with money will always have more influence in society, that will never change. This article is just too long to comment on everything. But, I will add that Black bought into the Social Justice / Government Dependence in the 1960s Hook, Line and Sinker. Until Black stop looking at every aspect of life with Black Glasses on, they will always be behind the times with low success rates. The key factor is the decimation of the Black Family. Since the 60's, majority of Black children are born to single mothers in already in poverty. The generational poverty is overpowering, very few grow out of it. The so-called giving of a Hand-up has peaked and has become a Hand-out for far too many in the Black community. America's poor has become an acceptable level of comfort and there always reaches a point of no turning back. In my opinion. A major,major problem is crime. EVERY DAY a black person is killed by another black person. Why is this ignored? This minister is not speaking and helping stop the worse thing happening to black Detroiters. Kids are dying, and losing their mothers, fathers, siblings and relatives to gun violence in a culture of revenge and retaliation. Crime is down. Yay! We only had 300+ murders in 1 year. 300 people who have grieving family members. Who is speaking for them? There's a lot of talk about Detroit still owning it's assets, that's not true. The DIA is gone for sure and owning is controlling. If you don't control an asset, you don't own it. So goes Cobo Convention Center, the RiverFront, the water department and so on. The City Council of Detroit is a toothless tiger begging for permission to spend money. There's really a governor's appointee in the Mayor's office. The one thing that black people had in Detroit City was political power as a check and balance to white economic power but that political power has been seized and usurped by Emergency Management and a series of political puppets in controlling offices.